I absolutely LOVE this barstool. I purchased 3 to sit at my island in the kitchen. It is a very modern look and is made from quality materials. Great addition to my decor!! Cushy and chic, the Tower stool offers modern style with plush comfort. Constructed from sturdy metal, the shiny chrome frame features an adjustable base and 360-degree swivel capability. The foam-padded seat is upholstered in faux leather for easy cleaning and come in three neutral colors. Dimensions 20.0 In. X 17.75 In. The chair looks nice, but the seat cushion is very thin. It's uncomfortable to sit in for longer than 10-15 minutes. Great for the price. Comfy seat, and it’s great to have a stool with some back support. The only thing we didn’t love was how shiny the base chrome look metal is. It makes it look a little cheap, but as I said, still great for the price. Nice, modern, clean look that’s great for an apartment. These are probably the most comfortable barstools I have ever sat in. We love the modern look too! These work great at our kitchen island and wipe down well. The look amazing, too. A little awkward for larger adults (my husband is 6'3" and is about at the limit). 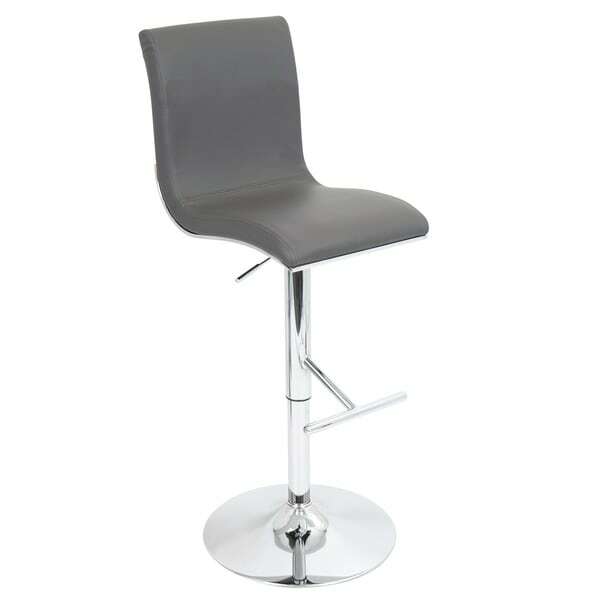 I ordered 2 Barstools and I could not have been any happier. There are an amazing addition to my apartment. I also like the quality of them. They are not made from some cheap materials and I am sure they will last. The assembly was very easy and quick. I think it didn't even take 10mins. They are very soft comfortable. They were delivered 3 days ahead of estimated delivery date!!! The price of these stools for the quality is so affordable! They look super expensive in person. Very easy to assemble. I am very pleased with the purchase. We bought 3 of them. Ordered 3 for my kitchen. Love them! Very comfortable & adjustable height is great. I do have wood floors & have found you do have to be careful when moving them to not scratch the floor. Good quality for the price ! I love these stools. They are comfortable and made well. The size is great. I love the back support. The look exactly like the picture. "What is the diameter of the base?" "Does the order come with 2 stools (set) or is it just a single stool?" This listing is for one stool.